It seems as if nowadays, more and more financial institutions are making the long overdue digital transition. With this transition, comes efficiency and smarter financial decisions. Knowing Fintech trends is a now must. 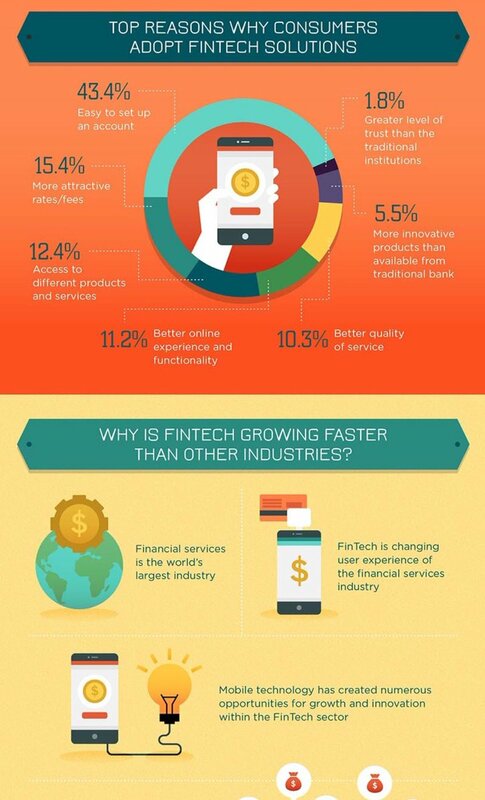 The following infographics present the current state of Fintech, and point out a few important Fintech industry trends. The top reason why consumers adopt Fintech is actually quite unexpected. Setting aside the technical and financial benefits for a moment, you might be shocked that 43.4% of consumers state that the major reason to adopt Fintech is because it’s simply easy to set up an account, so why not? Often, setting up the account is the most complicated part to adopting a new system, which deters users. The fact that Fintech makes it easy to implement at the beginning is very telling as to the rest of its features. In addition, 15.4% of consumers say that it has great rates and fees, and 12.4% adopt Fintech because of the access to the various products and services it provides. For a more detailed outlook on the Fintech industry, take a look at this additional infographic which provides fascinating statistics such as the significant rise in global investment and predicted successes for the future of the industry. Moreover, discover the most popular focus areas where Fintech helps to simplify and refine the experience. This excellent and informative video by Investopedia outlines all that Fintech encompasses along with providing a great explanation of the key benefits of transitioning to Fintech. From the financial industry which includes advancements in financial literacy and education, retail banking and more, this advanced concept is applied to improve methods people use to perform business transactions.